It has been mentioned before on these pages, that behind many of the events that we have witnessed and enjoyed, is a person with a vision of seeing others have a good time around vintage machines. Whether it is a Ride (see Classic RS Rally) or a museum (see The Moto Museum), or some other event, we are always surprised and appreciative of the mountain of work that it takes to help people enjoy themselves. And so it is with Bill Dwyer. The story goes that Bill was disenchanted with a prior show that was short on substance but long on ticket prices. He set out to prove that you could have a great quality event without charging attendees very much. 8 years later, the show continues to expand, and most of it is free !! You heard correctly, F R E E.
There is a host campground, and although you are not compelled to stay there, the main events are all within walking distance. There is a Thursday open house with a local air-cooled parts warehouse. Free. There is a beach event where you have to pay $20 (charged by the city to anyone, not a fee from the event) for beach access, but we got a free t-shirt and sun screen from the VW crew as compensation. There is a Bulli-Brigade event simultaneously at a public beach. Free. There is a Bay Window Rally at the main campground. Free. There is a Saturday night pre-show party at Guiseppe’s Pizza complete with DJ. Free, but you buy your own food if you want. The event has grown too large for this venue, and probably needs to move. And then there is the big show on Sunday. Free. The show on Sunday is the crown jewel. The location is picturesque, as VWs of all kinds ring the municipal lake. In Port Orange. There is a swap meet area, a new vendor area, and the DJ returns to entertain the crowd. But the stars are the continuous circle of vehicles lining both sides of the ring road. It is whiplash city for fans of air-cooled Vdubs. We had a recent post on the Platform as Canvas, and this event personifies the concept. No two vehicles are alike, there are no real rules for what can be done, and everyone is ok with everything. To say that Bill Dwyer has succeeded in the quest to provide great quality and substance for little or no money, is an understatement. My guess is that T-shirt sales, the only obvious attempt to recoup some costs, are all the more robust because of the format. It is almost your duty to purchase one. We did. IThe Zundapp Citation was clearly a derivative of the Horex Imperator, and was reportedly only branded a Zundapp in order to work around the legal restrictions of the US importer Berliner Motors. The Imperator was a 400cc twin produced in the waning days of Horex before it was purchased by Mercedes (see Horex Motorcycles). The Zundapp version created an oversquare bore and stroke, and overhead cam to reach 452cc and to produce 40 hp. This was enough to market the it as a 500, and claim 100+ mph speeds. Not bad in 1958. It was named the Citation after the triple-crown winning horse. Despite good quality, performance, and design, timing could not have been worse. The bike was introduced into the teeth of a worldwide recession. On top of that, a series of marketing and legal issues impacted sales in the important US market. The Citation was limited to a 2 year life span from 1958 to 1960. Somehow, the cars of mid-20th-century Germany lend themselves more than the products of any other nation, to become platforms for Art. Why? I do not know, but there are few production cars from France or Italy, or England, or Japan, or America, that have found themselves used so much as a conceptual or a literal canvas. Contrast this with the Janis Joplin Porsche 356, the Andy Warhol BMW M1, or the political-environmental-philosophical platform (wanted or not) that is the VW Bus. This is an ongoing tradition with Porsche RSR Pink Pig, with Audi commissioning an RS4 art car back in 2007, Opel Adam art cars, and even a Mercedes Benz Metris van!. While BMW deserves credit for the long-running official commissioning of art cars, all other German manufacturers seem to have embraced the concept. And long before the manufacturers, people were doing the same as an expression of their individuality, or as experimentation with a new mobile medium, the car. For a country so well known for its engineering prowess, it is an interesting contrast. Few would argue, though that as a platform for art, the VW Beetle is king. Perhaps because it is ubiquitous with over 21 million sold. The Toyota Corolla has sold twice as many, but it is not known as a platform for art.. Perhaps it is because the Beetle is universally understood and transcends languages and continents. Perhaps because it makes everyone smile. Perhaps because they are as cheap and available as actual canvas. Perhaps because from the beginning, they were the basis for many different manifestations. 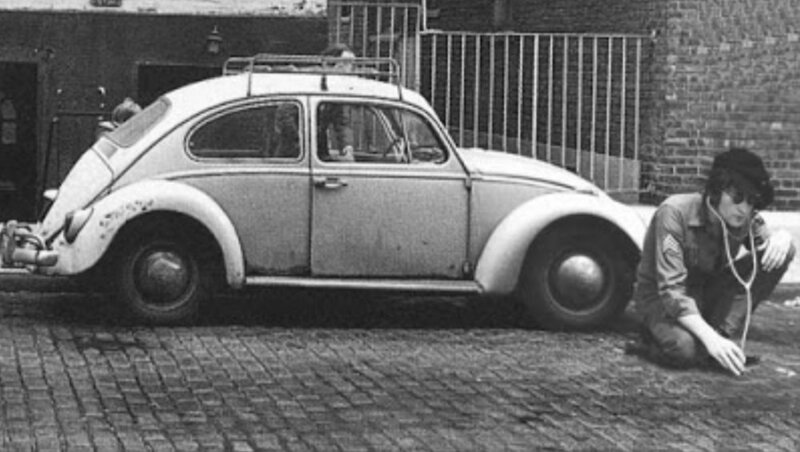 Almost all of the VW air-cooled vehicles came from the Beetle. The Bus is famously a lengthened and reinforced Beetle chassis. The Thing, the Fastback, the Notch, the Ghia, the Fridolin, etc were really all modified re-bodied Beetles. Then there are the variations made by VW and other manufacturers. The Amelia Island Concours recently had a class just for this category. It featured versions by Rometsch, Dannenhauer and Stauss, and Hebmuller. What was not featured, was a Porsche 356, which is perhaps the most obvious variant, owing to their common designer, Ferdinand Porsche. Then there are the later variations on the platform like the Puma and the Beach Buggy, and inumerable kit cars. The list goes on. But back to art. Commercial art has long taken notice of the Beetle as well. It is often turned into a mouse or a Bug or spider by exterminators, or into a taxi, or a unique delivery vehicle of some kind. It gets used positively and negatively to depict a slower pace, or hippies, or simplicity, or a bygone era. The headlights get eyelashes, the bumper becomes an accentuated smile, or the whole thing becomes a Transformer. I won’t even delve into the many applications of the Beetle that Hollywood has found, except for one word. Herbie. For the more commonly used canvas, you need go no further than your regional VW show. You will still see variations you have not seen before. In a field of dozens or hundreds of cars, few if any will have an identical twin. Structure, drivetrain, paint, interior, and wheels, seem to create an infinite number of permutations. You laugh and grimmace and admire and stare slack-jawed at the pieces in this outdoor gallery. It is truly an art show with the VW as the canvas. The people’s choice award is as much about artistry as it is about anything else. The Beetle is a universal canvas in the way that a BMW 3.0CS could never be. You can probably find a disintegrating one to use as sculpture somewhere near you. You can use just the shape, or a rear decklid, or a fender, or a hubcap, and everyone will know what you mean. It works as a stick cartoon, and as a fine art oil painting. It can evoke an era, or it can evoke a whole drag-racing class. Usually in art, you want to stay away from an icon, but in this case, a new VW Beetle based car could be driving around your town, or screaming down your local drag strip tomorrow. And a new VW Beetle art car could easily be in the world’s finest museums that same day. Recently we offered a post that was titled Old is the New New. Well nothing says old like a BMW boxer. A basic design from 1923, that even eschewed water cooling until 2014. However, the new machines are packed with modern technology, and compete with the best the world can produce. Indeed, with the RNineT, BMW itself is mining its past and producing retro machines. They are inspired by artists and artisans that, much like Harley Davidson’s knucklehead community, see the boxer as a timeless platform that can be forever re-imagined. We recently had the opportunity to spend some time around two excellent samples. The heart of the machines is pure BMW, but the creations come from Japan, and America. “Nostalgia” states its’ case with the name, and was created by NMOTO Studio. It pays direct homage to the BMW R7 of 1934, which was shown as a prototype, but never actually produced. It is considered by many to represent the pinnacle of Art Deco motorcycle design. Nostalgia is based on the new RNineT platform, but it is all about the beautiful bodywork. NMOTO has done a great job of incorporating most of the design elements from the R7. In particular, the fenders and the tank side panels and the exhaust, combine to fool the casual observer into thinking a priceless prewar motorcycle was on display. The headlight nacelle and the paint are similarly convincing. The big disc brakes and valve covers are the main visual cues that this is a modern creation. Other than that, it successfully evokes the pressed steel frame and Art Deco aesthetic that the R7 represented. The best part is that you can have your own Nostalgia. It is in limited production and is sure to stop traffic and dominate your local bike show. “Departed” takes a different approach. It is a custom built one-off commissioned by BMW Motorrad, and created by Uichi Yoshizawa and Yoshikazu Ueda of Custom Works ZON. It is all about the engine, which is reportedly a BMW Motorrad prototype. If the engine is a mere accessory to the body on Nostalgia, then the rest of the bike is an accessory to the engine on Departed. It dominates the motorcycle, and the duo uses the valve covers and alternator cover and the rear wheel center, to evoke its own Art Deco theme. This is complemented by tank and side covers and a breast plate all in metal finish, and reminiscent of a WWII fighter plane. Even the stubbed exhaust and trellis frame add to that image. This is a good thing, as it is designed to be a land speed racer, complete with rear sets, minimalist seat, and no lighting. And in case you think the large wheels create a more modern feel, the fabulous swingarm, the beautiful girder fork and exposed drive shaft will pull you right back to the prewar era. Ironically, Departed has a diminutive front disc brake that would fit inside that of Nostalgia. Who can pass up a weekend of vintage racing at a historic track? Not the Classic Velocity crew. The weekend is organized by SVRA, whose motto is “Some people collect art, we race it”. And that motto was in full bloom in early March as competitors and fans converged on the heart of Florida. Perhaps it is the venue, or perhaps the entry fees, but this particular event tends to have more fly-and-drive participants and more expensive cars. There were a lot of “race management” outfits in the paddock, and fewer DIY solo competitors. However, this in turn resulted in more high-end and historic art that was raced. Porsche was by far the most popular marque, but Ferrari and Aston Martin were also well represented. As always, it is the people that make these events so enjoyable. I had a chance to speak with the owner of the lovely 914 pictured here. The owner did all of the work himself other than paint, trailered it from Phoenix, ran it, wrenched it, and still had time to tell me all about it and swap 914 stories. Commendable indeed. At the other end of the spectrum, I got to spend some quality time with one of the Audi suspension technicians for the WEC LMP car of Tom Kristiensen and Alan McNish. I got up close and personal with the car and changes they had to make to the suspension for the relatively bumpy Sebring circuit. Suffice it to say that there was not a lot of suspension travel on those cars, and not much seat padding either!! It gives you new appreciation for what it must be like to do a multi-hour stint in a car like that. Oh, and the rear suspension arms cost more than the 914 ! There was also a car show sponsored by Hagerty which included an eclectic mix of vehicles from an Austin A35 to a VW Westfalia, to a Ferrari to a Pontiac Grand Safari (one of the largest of the behemoth station wagons of the 1970s). There were enough items of interest to keep any gearhead engaged over a few days, and the access and approachability of those in the paddock made this a special event. The Bitter SC was the successor to the Bitter CD chronicled here before (see Sweet Bitter). It entered the market in 1979, even as CDs were still available. Although it was based on the largest of the Opel platforms, the styling was very Italian, and it could almost be mistaken for the Ferrari 412. This was not a bad thing, as it is clearly a handsome coupe. Much of the car was built in Italy, first at OCRA, and then at Maggiore, but eventually by Steyr-Daimler-Puch in Austria. All cars then came back to Schwein, Germany for final assembly or for inspection. The car was powered by a 3.0 or a 3.9 liter inline 6 cylinder., and produced 180hp. or 210hp respectively. It used Bosch fuel injection. Weighing 3500lbs, they used that power to propel the car to an 8.3 second 0-60 time. Bitter went to great effort to create a premium car, with a luxurious interior including leather and woodgrain. A sedan, and a cabriolet were added in 1981. Just 488 were built, and only a handful came to the US, where they were carried by a few Buick dealers due to a deal with GM. That placement did not help, and US sales were tepid. However, demand was outstripping supply elsewhere, hence the move to Austria for much of the manufacturing. In an interesting twist, Bitter had difficulties with US emissions despite using a US vendor to handle that area. They eventually used a Porsche catalytic converter to solve their issues! They were also up against the rise of the BMW sedan, and other premium offerings. Lastly, the idea of a rebodied car was now primarily the domain of the supercar. No matter how nice it looked, and no matter how well executed, a rebodied Opel was going to be a challenge. Today, the SC from this period remains popular, and the wedge styling has stood the test of time. Part of the appeal is the mile-munching capability. They are reknown for racking up mileages in the hundreds of thousands. Few cars can say that, and even fewer bikes. Second, they are reliable. which permits the first point. Occasional valve adjustments and quality oil are the primary requirements. Not that they have not had recalls and other issues in the modern era, but few compared to other marques. Third, they are comfortable, which also permits the first. Fourth, they are sporty enough. There are others in the segment that are sportier, but better riders than me have yet to know the limits of a modern RT on a twisty road. They handle well. Fifth, is storage capacity. You have to move to a true luxo-barge like the Goldwing or the K1600 to get any more storage. Sixth is weather protection. A generous fairing protects lower body. The hands are protected by the mirrors which have excellent visibility. They always had a large windshield, but the adjustable ones in the modern area can shield your upper body to the point of staying mostly dry in light rain. Seventh are the electronics. They are more and more sophisticated, but even on my R80RT, the alternator and the accessory plugs were intended to allow the rider to use heated gear and to power radios and auxiliary lights. In position 8 is the headlight. In my opinion, he RT has always had a good enough headlight to leave the machine stock. My R80RT has a pretty good headlight for a 35 year old machine. The R1200RT has a really good headlight, stock. Ninth are passenger accommodations. Once again, true to its roots, the RT shines with a wide comfy passenger seat and rubberized pegs. The top box doubles as backrest. Last at number 10, is suspension. Between reasonable weight that disappears once underway, paralever, and good suspension when loaded with passenger and luggage, the RT never feels unbalanced. In fact, my R1150RT seemed to feel better two-up! So there you have it. Ten reasons the RT is a fantastic motorcycle from any generation, and the reason that it remains in, and returns to, the Classic Velocity garage. If this seems like a good model name for a motorcycle, you are partially right. The BMW 700 was a very important vehicle for the company and we have previously covered it (see BMW 700). In that article, we pointed out that it was a successful combination of a car’s body wrapped around a motorcycle engine. We also mentioned that it enjoyed some racing success with the GT and RS models. The 700RS was built specifically for hillclimbs, and featured an aluminum space frame chassis bearing little resemblance to the production 700 that shared part of its name. In true testament to the racing ethos of the time, it retained the 697cc motorcycle engine but managed to produce 70 hp from that unit. With a curb weight of just 1213 lbs, it had 100 hp per liter of displacement, and 127 hp per ton. Amazing numbers at the time, and very much aligned with racers like Lotus. It also handled very well given that it was mid-engined, and low and sleek. The 700RS went on to numerous victories in the early 1960s, piloted by such racing luminaries as Alex Von Falkenhausen, and Hans Stuck. Regular readers will know that Zweirad Union was the parent company for several brands, most notably Victoria, Express and DKW, and has been featured several times in these pages. The late 1950s saw the death of many German motorcycle producers, and Zweirad had acquired an ailing Victoria in 1957, a dying Express in 1958, and a castoff DKW in 1959. The idea of the new Director Dr Odilo Burkart, was to leverage models and tooling in Nuremburg to produce models for all three brands. One result of this approach was the avant-garde Zweirad Union Type 115/155, produced from 1960 to 1963. The 115 was a Victoria model, and the 155 was the almost identical DKW. They were aimed at younger buyers in an attempt to keep them on a sportier looking two-wheeler rather than going to one of the many affordable small cars that were on the market. The first thing that jumps out at you is the futuristic styling, evoking images of jets and space-age conveyances. The body lines suggest forward motion even standing still, and the chrome finned engine cover contribute a sense of speed. All of this is ironic, given that this is a 50cc 4.2 hp machine. Styling was polarizing at the time, but sales were fairly solid with 13,551 Victorias to 13,345 DKWs over the production span. The machines became affectionately known as “Blechbanane” or Tin Banana. The late 1940s and the early 1950s represent one of those periods where the automobile and the motorcycle world were experimenting with hybrids. In this case, a hybrid is referring to a machine which was in part motorcycle, and in part car. A car was a relatively expensive item to purchase, and motorcycles were still mainstream reliable transportation in Europe. Manufacturers understandably wanted to find a combination of these two that would produce an inexpensive reliable machine which would protect the driver and occupants from the weather. 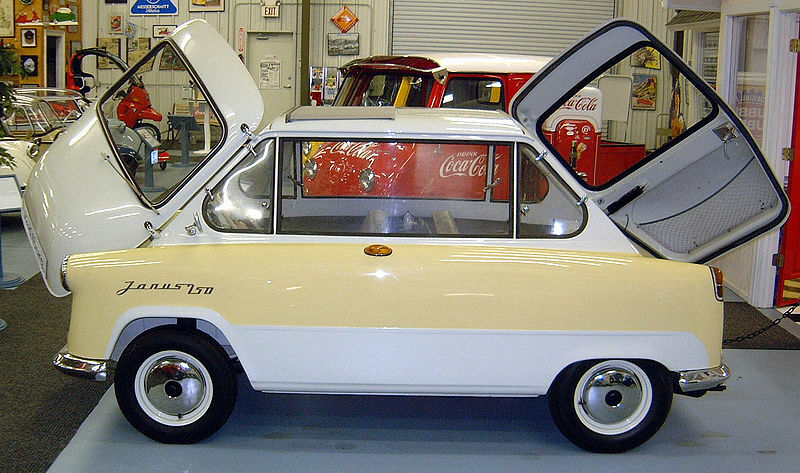 One manifestation of that combination was the micro car, and we have covered a few variations of that in this blog such as the Messerschmidt (see The Other Microcar) and the BMW 700 (see Heart of a Bike, Body of a Car). One particularly interesting variation was The Zundapp Janus. 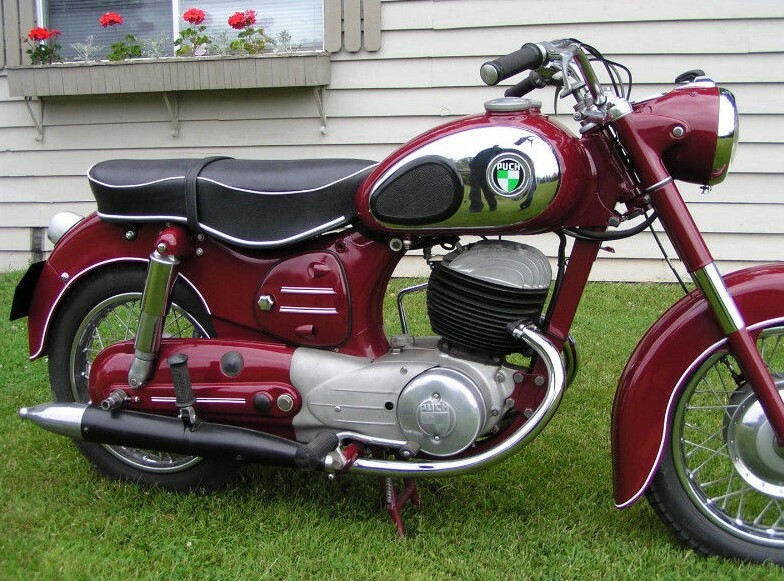 It was produced in 1957 and 1958, and was the only car ever produced by Zundapp which of course specialized in motorcycles (see Volksmotorrader and The Green Elephant). The Janus got its name from the Roman god who also gave us the month of January. The distinguishing feature of Janus was that he was two-faced and could look backwards and forwards at the same time. The Zundapp Janus was similarly almost symmetrical front to back, and were it not for brake lights and turn signals in the back versus the headlights up front, you might have trouble distinguishing which way the vehicle was going from a side profile. This extended to the seating in the car with one bench seat facing forward and the other bench seat facing backwards. Both seats folded down to form a flat head when needed. A clamshell door opened either end of the vehicle further adding to the symmetry. The Zundapp Sport Combinette was produced from 1962 to 1966, and fit into a special new class of Vehicle at the time in Germany. It was based on the prior Combinette which was a single seat step-through model. Starting in 1960, a Moped without pedals but with kickstart was introduced as a new category. It blurred the lines between motorcycle and moped, although displacement limitations kept it closer to the latter. Zundapp took advantage of this by introducing the Sport Combinette. It had two seats, a tubular frame, telescopic fork, 21” front wheel, atraditional tank layout, and even a clutch (of sorts), all consistent with motorcycles. However, the single cylinder 2 stroke engine was only 50cc and top speed matched the new category limit of 40kph. The local BMW club, FSCBMWCCA, organized an outing to the Sebring Historics, and we tagged along. Sebring is a historic track with a rich legacy. The Historics event is an opportunity for historic and vintage sports cars to enjoy a race weekend in the central Florida “fall” weather. This translated into foggy mornings with sunny days with highs in the low 80s. The event also features a vintage aircraft fly-in with most from the WWII era. The display area for these machines was interesting by itself. Radial aircraft engines in particular are fascinating for their simplicity and reliability. And that brings us back to endurance racing where both of those virtues can help you to emerge victorious. The racing portion of this event is organized by Historic Sportscar Racing (HSR). In the sprint races, a couple of Porsche 914/6 cars dominated group 2 and 3 with a BMW E36 sandwiched in between. A Porsche 911 RSR was on the podium in group 5 and 7, and there was a Classic RS race. A couple of 2002s were sprinkled among the field, but none managed to run at the front. The highlight is the Classic 12 hour, and a pair of Lola’s finished 1-2. The entire field was interesting with Ginettas and GT40s and Elans and longhood 911s and Cobras battling it out. Like all historic events, the pits provide an opportunity to get up close and personal with some very cool machinery. Owners, drivers, and mechanics are all very tolerant of onlookers and questions. We had a great conversation around a BMW M Coupe, and got to climb inside an RSR. Very cool. Back at the club corral, there were some interesting machines as well. Not one, but two Z8s graced us with their presence, along with a couple of nice original M5s and an M2. Cool people, cool cars, cool competition. Not a bad way to bring in December. The Petersen Museum is routinely regarded as one of the world’s best. From the building itself, now with an artistic exoskeleton, to the contents, it sets high expectations. We have visited before (see A Visit to the Petersen), but it has been a while. The Petersen is large enough to have multiple exhibits going on within its walls at any given time. It keeps it fresh for return visitors, and they have a ridiculous inventory of vehicles to rotate through and to borrow. This is, after all, Southern California, and Hollywood is a stone’s throw away. This visit was special because the museum was running a Porsche exhibit. Dubbed “The Porsche Effect”, the exhibit chronicles the history of Porsche from beginning to modern times. This is a challenge that the Porsche Museum struggles with, so the Petersen had to have an interesting approach. That approach was centered around a strategic sampling of machines, augmented by some storytelling posters and placards. If you are a stickler for chronology, you could proceed in a roughly anti-clockwise direction on the first floor. If not, you could just move easily from perfect examples to prototypes that never saw production, to race cars. This show could fill the entire Museum, but it was all housed in a portion of the first floor. Despite this, it did a good job of creating a journey. An entire wall was dedicated to the memorable and iconic race cars from the 550 to LMP. A 356A started the road car story, but along the way you got to see a 904, the early 911, the 914, a slant nose, a 4 door 928 birthday gift to Ferdinand, a Ruf right in the lobby, and the last of the air-cooled 993. And, in the style of the Petersen, you could get right up close with all of the cars. If a particular model lives for 16 years, it is pretty remarkable. It is particularly remarkable if it was launched in 1953, at a time when “new and exciting” caused manufacturers to replace or upgrade models every few years. But from the launch of the 250 SGS (Schwing Gabel Sport), Puch found a formula that worked, and stuck with it. Puch was formed in 1890 by Johann Puch in Graz, Austria, and began like so many others producing bicycles before moving on to motorcycles in 1903. Fast forward to 1923 when they first introduced the innovative split single. Essentially, it was two pistons in a shared combustion chamber. The idea would later be reborn or licensed in other marques, as Puch supplied engines as well. The twingle did not take long to achieve success success, as a supercharged version won the German Grand Prix in 1931 with Alvetio Toricelli aboard. By this time they had become part of the larger Steyr-Daimler-Puch corporation. Fast forward again to 1947 when Puch resumed production of the 250. Then in 1953, they launched new 125cc, 175cc, and 250cc motorcycles including the 250 SGS. Exports soon followed, and in the USA, Puch was rebranded as an Allstate motorcycle sold by Sears with the moniker of “Twingle” to describe the piston/cylinder arrangement. It was famously sold through the Sears Roebuck catalogs. 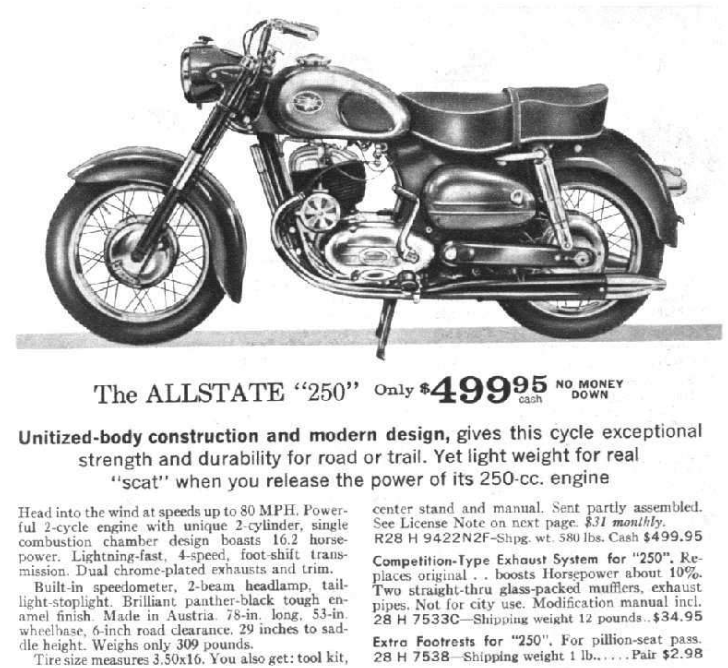 Pricing and catalog sales resulted in this being the first motorcycle for a lot of riders in America. The engine of the 250 SGS was a 248cc 2 stroke unit mated to a four speed gearbox. It produced 16.5hp and 12.5 ft/lbs of torque combined with a weight of 309lbs, for a top speed of 68mph. Brakes were drum front and rear. Suspension was twin shock swingarm in the rear, and telescopic forks up front. A respectable set of features in the beginning, but Puch made few changes and by the 1960s it had fallen behind competitive 4 stroke offerings. The SGS retained its appeal to new and younger riders, and soldiered on until production ceased in 1969. During its lengthy tenure, 38,584 units were sold worldwide, making it a success for a firm like Puch. Check out this period article on a strip down of the 250 engine…. As a blog dedicated to Classic German machines on two wheels and four, there are certain events that are legendary and represent the high point of the year. Regardless of where you are geographically, the Orange County Transporter Organization event twice a year is in that category if you own a 1967 and earlier VW Bus. California is a Mecca for Aircooled Vdubs in general, and buses in particular (with all due respect to the Pacific Northwest, New England, and Florida). The OCTO event was happening before Buses were cool again, and persists regardless of auction prices and celebrity collectors. It is rain or shine, and this year, in a freak of Southern California nature, it rained! Even with the weather as a factor, this event dwarfs gatherings of Splitty buses elsewhere in the country. Almost all are driven to the event. Almost all are driven regularly. Many are daily drivers. Every configuration was represented at the show. Kombis, Deluxe in 13 15 21 and 23 window versions, single and double cabs, panel vans, Campers with all configurations of tops, and even a fire truck. No two buses alike, just like the owners. The swap meet was the area most impacted by the weather, as few wanted their oxidized parts further oxidized. Which brings us to patina. Patina is in. There were a lot of buses with engine, suspension, and brakes up to relatively modern standards, but with the body in various states of decay. That decay was often clear coated to preserve it, or in some cases, an aging process was used to create the decay or the appearance of decay. Logo panel vans were similarly treated to reveal an old logo, or create one that looks period correct. Some real artistry was on display along with a good deal of time, effort, and money. The following day was the Pomona Swap Meet. Although there is a swap portion which is all VW, this event is huge, and the show field isy acres of vintage iron from low rider 50s Cadillacs to Audi Foxes, to Delorean Back-To-The-Future replicas, to a wild shorty Beetle. Everything at this show was cool even if not always your particular cup of tea. The wild and wacky share space with the concours queens. There are plenty of YouTube videos that can help you grasp this better than words. What they can’t help you to appreciate is the vibe in the air. It is a giant cars-n-coffee meets carnival meets swap meet. It is sensory overload. If your car is “special”, and by that we mean special as in concours level or special in modifications, or special in patina, or special in paint, or special as in custom, or special as in weird, this is the place to be. There were plenty of “regular” examples present, but this event is much more spectacle than it is subtle appreciation society. Make sure you have good lubrication for your human neck bearing, as it will be swiveling a lot. The best part is that this show happens 6 or 7 times a year! I am told by devoted attendees that every show is just as crazy and vibrant as this one. Between the two events, we laughed, we wept, we coveted, we scratched our heads, we were shocked and awed, we stood slack-jawed, we marveled at craftsmanship, and we expanded our understanding of what is possible, and we gained a greater appreciation for the sheer diversity of thoughts on the automobile as an art canvas. With two events like these (and there were many other events in South/Central California that weekend), and good weather year round (except Saturday ;-), you can understand how many consider this to be one of the global centers of car culture. Tornax was a motorcycle manufacturer from Wuppertal, Germany that was founded in 1922 by Ernst Wewer, but began motorcycle production in 1926. Wewer was a racer, and recruited other racers to help quickly build a name for Tornax (a play on the word for Tornado). Like many manufacturers at the time, they did not produce their own engines, instead using British JAP (J. A. Prestwich) engines of various capacities. Their first machine was a 600cc single called the I-26. In the beginning, Tornax used the year of production in their model names rather than displacement or catchy names. Also unlike other manufacturers, Tornax started with large machines and later went to smaller displacement models. peaking with the 1,000 cc four stroke III-31 SS, which produced a claimed 76hp, and was claimed to be the fastest machine in the world. It was a large impressive machine, but an expensive one with bad timing in the market given the depression. Tornax survived the 1930s by first producing smaller machines, and then reducing its output to a single 600cc model using an engine from German supplier, Columbus. It also moved away from alphanumeric model names and adopted catchy names like Tornado, and Rex (which interestingly utilized a DKW engine), and Schwarze Josephine. The factory was destroyed in WWII, but Tornax resumed production in 1948. Ironically, they resumed with a 125cc two-stroke single cylinder model. This was followed by a 175cc, a 250cc and then a twin cylinder 250cc Earles Fork model producing 15hp. A far cry from their 1,000cc 76hp peak! Then in 1954, Tornax purchased the rights to german engine-builder Opti’s four stroke machines to eliminate contracts with ILO, Columbus, and others. Effectively moving engine building in-house. This transition was problematic, and proved to be financially debilitating. At the same time, small enclosed vehicles like the Isetta, Messerschmidt, Heinkel, and Lloyd were emerging to challenge the motorcycle market in general. These factors proved to be overwhelming, and within a year, Tornax ceased production in 1955. A thriving club of enthusiasts remains today in Germany. Brought to you by MOTOCRON : Record, Monitor, Analyze, Report, on activities for all of your vehicles. If you are a fan of old motorcycles, there is no better place to be in October than the Barber Vintage Festival. It grows each year and has seen more than 70,000 attendees. The reasons are simple. A best-in-the-world vintage motorcycle museum. A well-designed race track. Vintage racing. Beautiful grounds. Great camping. Thousands of vintage gearheads, ensuring tremendous variety and great discussions. It is all here in one place. The museum has been covered here before (see Bowing to Barber), so suffice it to say that it is worth a road trip or even a plane trip by itself, and you should find your way there. The fact that it is just part of the reason to go to the festival makes this an even greater event. Like the Goodwood Festival (see The Revival), it is a multi-day event which surrounds the perimeter of the race track. The racing, which is part of the AHRMA series, involves several vintage classes including sidecars, novice classes, lightweight, heavyweight, and more. A stroll through the pits is an experiential history of motorcycle racing. And craftsmanship. Solutions often need to be invented and/or fabricated. Vintage clubs of all stripes also make this event a formal gathering. You can hangout on Norton Hill, or join the VJMC contingent or the AMCA encampment, or the Airheads, to name a few. The Ace Corner catered to a lively gang of grey-haired rockers! If you can’t find members of your tribe at this event, they may be on the verge of extinction ;-) The larger gatherings had judged shows and their own mini festival. Manufacturers and vendors are also there in abundance. You could test ride a new Harley, KTM or BMW, you could enjoy an Enfield, or use a Ural. But you could also pickup some cafe racer parts or a vintage style helmet. If, however, you were after original bikes and parts, the swap area was the place to do it. It is now expanded due to growth, so there are two separate areas. This is nowhere near as large as Mid Ohio, but there is a significant array of machines and parts in every condition from NOS to COBAR (corroded beyond all recognition). Every other stall seemed to have a Honda Trail or a Cub for sale. And speaking of original, just like Goodwood, the parking lot can be as interesting as the show field. I have not seen so many Laverdas in one place in a long time, and not one, but three BMW R1200STs! The interesting choices for touring machines, and the innovative storage solutions in the camping area could be its own article. This is a must-do event for anyone in North America who is into vintage motorcycles. Whether you like racing, or concours, or touring, or swap meets, or just walking around for days looking at old bikes, this is a worthwhile event. Oh, and in case I forgot to mention it, there is the world’s best motorcycle museum with close to a thousand on display. I’m betting that you have not seen a Tornax in the flesh recently ! DKW with a pillion seat way off the rear…. Artwork was interspersed among the vintage iron..
Honda Cubs and Trails were everywhere…. It's official, we have run out of ideas. Electric cars, not new. Medicinal herbs, not new. Organic food, not new. Driverless cars, not new. Faded jeans, not new. And there is such an absence of new ideas in entertainment, that sequels, remakes, and recycling are the norm. For our more relevant space of vintage iron, there is also a movement these days to make new stuff old, and to keep old stuff…..well….old. This too is not new, as the rat rods of the mid 20th century had the same ethos. Take something old, and make it serviceable (or high performance), but leave the aesthetic looking like it was when found (or abandoned). There have even been schools within the movement that have taken something in good cosmetic shape, and distressed them, aged them, or otherwise altered them in order to look like a barn find. The spectrum is broad, so we thought that in true Classic Velocity style, we would categorize them. We did a related post on how close you are to being a purist a few years ago (see Tiers of Authenticity), so you can check that out as well. Preservation. This school is pretty straightforward. You alter nothing (or the minimum possible) to make the vehicle operate as it did when it last operated. There is even a market for non-operating preservation, where even the cobwebs remain undisturbed. Practication. You take an original vehicle as found, and make it practical to operate on a limited basis. This might involve more modern non-period-correct tires, corrosion inhibitor applied to the undercarriage, an LED bulb or two to replace the stock 1157, etc. The vehicle is not modified in any way, and the cosmetic patina is natural and continuing to evolve. Performication. Not to be confused with per-fornication. Different blog for that. This school might do any needed metalwork and then preserve the resulting aesthetic with a clear coat of the patina, so that it will not evolve further. There may be more extensive less visible structural work, suspension upgrades, engine upgrades, brake upgrades, etc to make the vehicle competent with, or superior to, today's vehicles. The closer you get it to looking like category one or two, the more impressive it is. The better the performance, the more impressive it is. Oldification. This school takes something new and typically high performance, and makes it look old aesthetically. We are not talking here about the many retro and homage vehicles produced by manufacturers. 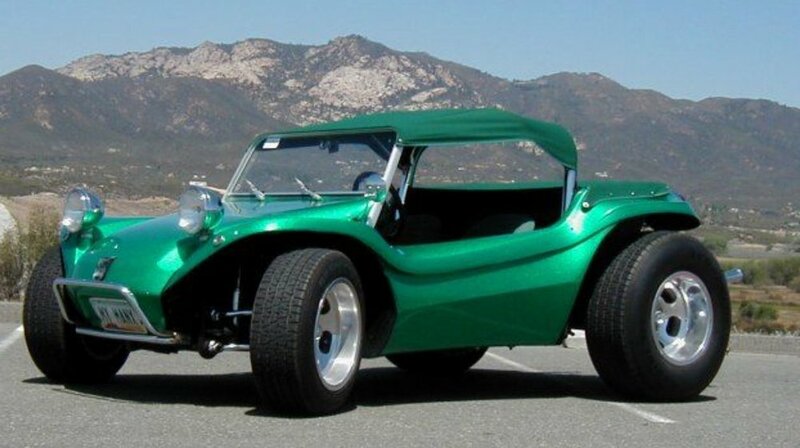 We are talking about putting a modified early 911 body on a modern 911 chassis and drive train, or putting a new BMW 1200 (now 1250) motor in a modified R60/2 chassis, or somehow using a current Mustang platform for a Model A hotrod, or a Hayabusa engine in your Isetta. There are some pretty expensive paint jobs and interiors out there that look like they are old, distressed, corroded, sun bleached. Aircooled Vdubs (which are already old) have members of this school. A variation are motorcycle tanks with faux bullet holes painted oxidation red, and aged brown leather seats. Technically you could consider Chip Foose, Kindig-It, and their ilk to be a variation on this theme. We could also argue though, that they represent the opposite, Newification. So where do you fall on the spectrum? Did we miss a category? Best comment wins a Motocron subscription.